Museums are very popular worldwide, and astoundingly diverse. One factor that has made them so successful is that the museum concept - a place where humans can encounter objects and use them to navigate their way through the world - is so easily adapted to different cultures (Simmons 2016). Although museums are widely recognized as the guardians of cultural memories and libraries of the natural world, it can be argued that what they do best is preserve the past so that it can be used to predict the future. Natural history museums comprise just a small portion of world museums, but their collections are vast - the Global Biodiversity Information Network (GBIF) estimates that natural history collections worldwide hold somewhere between 2 and 5 billion specimens (Ariño 2010). Writing recently about the future of natural history museums, Christopher Norris observed that museums are “the only type of scientific research facility that can claim the ability to time travel, albeit in a patchy and far from perfect way” (Norris 2017:13). Indeed, museum collections can be used to journey far back in time, to the very origin of the Earth and the dawn of biodiversity, as well as to travel forward in time to glimpse what the future may look like. Museums can do these things because their collections abound in real, three dimensional, documented objects (Latham and Simmons 2014). Collections predate museums by many millennia, but the origin of the modern museum lies in the cabinets of curiosities of the late Renaissance in Europe (Findlen 1989). In these collections, natural history specimens were first coveted as curiosities of nature. The owners of the cabinets were interested in things that were odd or unusual, strange, or wonderful (Mauriès 2002). Collectors had special interests what were termed monsters, aberrations from the normal such as animals with two heads, the bones of giants, and unicorn horns. The catalogs of many of these cabinets contain descriptions of such curiosities because it was believed that studying the exceptions to nature would produce a better understanding of nature itself (Daston and Park 2001). Collecting diverse and unusual objects gave one knowledge of the world (Hooper-Greenhill 1992). After 1500 natural history collections grew rapidly but changed in character as they increasingly became important tools for understanding life on Earth. Instead of cabinets filled with curiosities, collectors tried to create microcosms of the world by collecting as large a variety of objects as possible. This change resulted from the confluence of several currents, including increased global travel, improvements in preservation technology, and more sophisticated systems of classification that resulted from the development of modern scientific thought (Nieto Olarte 2013). It was at this point of change that natural history museums began to diverge from other types of museums. We can trace this development by beginning with a single specimen that led to a better understanding of biodiversity. Europeans grew obsessed with the Americas as unknown creatures and objects began arriving on their shores, starting with those brought back by Christopher Columbus (1450-1506; Bergeen 2011). Among the fascinating new animals was an aquatic toad from South America. What was probably the very first specimen of this toad to reach a European collection wound up in the hands of the former mayor of Amsterdam, Nicolaes Witsen (1641-1717), in the 1680s. The toad was a noticeably strange beast with a flattened body, a broad triangular head, and a pointed nose. It had huge webbed hind feet and its long, bony hands ended in star-shaped fingertips. 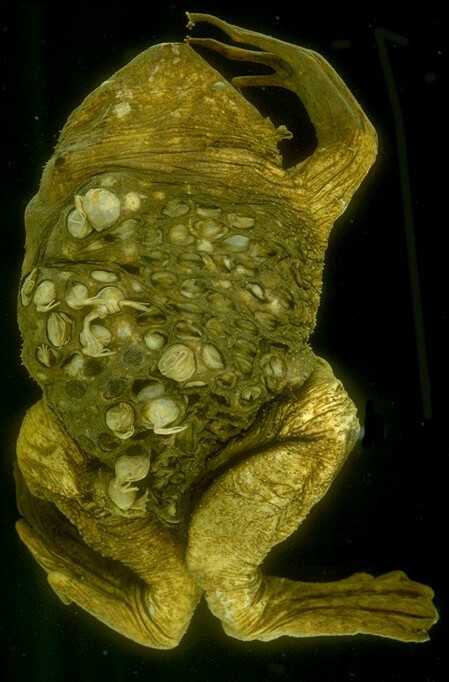 Strangest of all, its back was covered with little pits that held developing embryos. Nothing is known about where or how Witsen got his specimen (he probably purchased it from a sailor returning from a trip to the New World), but other collectors wanted one, too - and there were lots of other collectors. Another important thread in this history concerns a German woman who grew up in a well-known family of artists, engravers, and publishers, and later became a friend of Witsen (Figure 1). As a child, Maria Sibylla Merian (1647-1717), born in 1647 in Frankfurt, was intrigued by nature and spent much of her time outdoors, roaming through fields and forests looking for animals and plants (Todd 2007). Her particular interest was the metamorphosis of insects and amphibians. At age 39 she began dissecting specimens and studying their reproduction, making careful notes and drawings, at a time when it was unusual for a woman to undertake scientific work (Etheridge 2010, Reitsma 2008). Merian established herself as an artist, worked in the family business, married, and raised two daughters. After she joined a conservative protestant religious community known as the Labadists, she and her husband divorced in 1692. In September 1699, at age 51, she set out to achieve a life-long dream. She sold 225 of her paintings to finance a move to a Dutch colony in Suriname to study tropical plants and animals first hand (Todd 2007). Her companion on this journey was her younger daughter, Dorothea Maria, then 20 years old. Among the many marvels that Merian found in the jungles of Surinam were several specimens of the strange aquatic toad that had so intrigued Nicolaes Witsen. Unlike Witsen, however, Merian was able to observe the living animals close up, watching as the young went through metamorphosis still embedded in the skin of their mother’s back, and emerged not as tadpoles but as fully formed toadlets (Etheridge 2010, Schmidt-Loske 2010). She made notes and sketches, and preserved a few specimens in brandy to bring back to Europe (Todd 2007). Although it had been Merian’s intention to remain in Surinam for five years, she contracted malaria and became so ill that she and Dorothea had to return to Europe after two years. Once back in Amsterdam, mother and daughter opened a studio in which they turned their sketches and notes into drawings and paintings, and a shop where they sold the specimens they brought back, as well as those received from Merian’s older daughter and son-in-law, who had later moved to Surinam themselves. They also sold brushes and paints concocted from Merian’s own formulas (Reitsma 2008, Todd 2007). After three years of work, Merian published her masterwork, Metamorphosis Insectorum Surinamensium, in 1705. Her book included illustrations of many animals and plants (not just insects, as the title implies), including the strange toad, along with her summary of its life history, information that was previously unknown to European naturalists. Her painting captured the correct posture of the toad as it floated in the water, detailed the emergence of the newly metamorphosed toadlets, and showed their independent swimming behavior (Figure 2). The famous anatomist Fredrick Ruysch (1638-1731), a friend of Merian, acquired specimens of the toad for his museum (Jorink 2010, Simmons and Snider 2012). In 1710 Ruysch published an illustrated catalog of his collection, which included a copperplate image of the toad by Joseph Mulder (1659-1718; Figure 3). Although Ruysch’s catalog, Thesaurus animalium primus, was published after Merian’s painting of the toad based on live animals she had observed and collected in Surinam, Ruysch claimed in a letter that his specimen was better than those that Merian had in her collection (Reitsma 2008). Another image of the toad was published in 1734 in the first volume of a massive catalog by another Amsterdam resident, Albertus Seba (1665-1736). The illustration in the catalog (titled Locupletissimi rerum naturalium thesauri accurata description, better known as Seba’s Thesaurus) was based on specimens in his collection. Seba was a successful apothecary whose collecting was an all-consuming hobby. Unlike Merian, Seba never went into the field to catch animals himself, but instead purchased specimens from returning sailors or from shops that sold curiosities of nature (Müsch 2001). This raises an interesting question - where did Seba get his specimens of the toad? There is a good possibility that he purchased them from Merian’s shop. Seba’s catalog is important for several reasons. It was extensively illustrated - Seba hired thirteen artists to produce the 446 plates in the four volumes published between 1734 and 1765 (Müsch 2001). The catalog covered not just Seba’s collection but also specimens from other collections because he wanted it to be as complete as possible (Willmann and Rust 2001). It was an extremely impressive and expensive accomplishment, made possible only because Seba collected specimens and cared for them. Seba’s Thesaurusis also important because it was the last major natural history catalog published before Carl Linnaeus (1707-1778) introduced his new system of classification, and before natural history collections went from the private to the public sphere. Classification systems have played a critical role in the development of natural history museums as well as in our understanding of biodiversity. The earliest classification of animals based on modern principles was the scala naturae (or “ladder of nature”) formulated by Aristotle (384-322 BC), which arrayed species according to their believed degree of “perfection” (Mayr 1969). Although Aristotle was much more of a naturalist than he was a taxonomist, for more than 2,000 years, he was considered the ultimate authority on natural history (Leroi 2014). Aristotle arranged animals in units that correspond roughly to modern genus and species concepts, using the terms genos (meaning kind), and eidos (meaning a form within a kind). As previously unknown species of animals and plants poured into European collections, it became obvious that Aristotle’s system was insufficient to classify them, so pioneering taxonomists such as John Ray (1627-1705) began to search for better systems. By this time, natural history specimens were being collected and preserved for serious study rather than as a hobby or for exhibition. Linnaeus used specimens in Seba’s collection as well as detailed images of insects painted by Merian in his work. The early editions of Linnaeus’s Systema Naturae (first published in 1735) cited specimens and illustrations in Seba’s collection 284 times, and cited Merian’s illustrations 136 times. Linnaeus had very rigid ideas about how taxonomy should be done, and like Aristotle he believed that all species were the result of divine creation. His creationist beliefs and desire for a simple system led him to adopt an essentialist and typological philosophy. Essentialist meant that only the essential characteristics of organisms were used to classify them; typological meant that he believed that species were created and did not change (evolve) over time. As a result, many of Linnaeus’s groupings of animals and plants did not reflect the evolutionary history of the organisms. Nevertheless, it was a system that provided consistent names in a hierarchical structure for both plants and animals, and in modified form, it is still in use today. Linnaeus is best known for developing the binomial system that uses two names for each organism (genus and species) and places them in hierarchical groups that share common characteristics. The toad from Surinam did not appear in Systema Naturae until the tenth edition, published in 1758 (and now recognized as the beginning of modern zoological classification). Linnaeus named the toad Rana pipa, and in his brief description cited the specimens that were figured in Seba’s 1734 Thesaurus (at that time, Linnaeus put all frogs and toads in the genus Rana). The specific name, pipa, is a Portuguese word that means kite, which is what the toad was called in Surinam. In 1768 the name of the genus was changed to Pipa when Josephus Nicolaus Laurenti (1735–1805) proposed the name Pipa americana for the toad, and it was later changed to Pipa pipa (Trueb and Cannatella 1986). From about 1750 through the 1800s, most of the big private natural history collections were sold or given to national museums that were being created across Europe and in the Americas (Simmons 2016). Two museums that were founded during this period, the Natural History Museum, London (1756) and the Muséum National d’Historie Naturelle in Paris (1793), acquired huge collections and remain two of the largest natural history museums in the world (Figure 4). London has 70,000,000 specimens; Paris has 60,000,000. The Smithsonian’s National Museum of Natural History (United States), founded in 1846, has approximately 126,000,000 specimens. Not all natural history museums founded in Europe in this period were so successful. The Museo Nacional de Ciencias Naturales in Madrid, founded in 1772, should have grown at about the same rate as London and Paris, but failed to prosper. As the former director of the museum, Pere Alberch (1854-1998), wrote in the introduction to a book about the museum, “The story told in this book is a sad tale, because it is also the history of Spanish science, a chronicle of what could have been but wasn’t” (Barreiro 1992:11). The museum suffered from underfunding and neglect, compounded later by the Spanish Civil War. Like other great museums of Europe, it received specimens from around the world (the first fossil skeleton to be assembled and exhibited, a Metatherium or giant ground sloth from South America, was in Madrid) but without adequate funding, it struggled. After Seba’s death, his family sold his collection to finance the printing of the last two volumes of his catalog. Seba’s specimens of Pipa pipa were purchased by the King of Sweden Adolf Fredrik (1710-1771), who added them to his personal cabinet of natural history kept in the royal castle in Ulriksdal, where Linnaeus examined them for the 1758 edition of Systema naturae. In 1801, the specimens were transferred to the Royal Swedish Academy of Sciences, and then to the Natukrhistoriska Riksmuseet (Swedish Museum of Natural History) in Stockholm in 1828 (Figure 5). After Charles Darwin (1809-1882) published On the Origin of Species in 1859, there was a major change in the nature of natural history collections. Before Darwin, classifications had been typological, based on the assumption that species were the result of divine creation and thus animals and plants could be sorted neatly into fixed “types.” This meant that if a museum had one or two specimens of each species, that was considered adequate. One of the key factors in the formulation of Darwin’s theory of “descent with modification” was that he spent significant time collecting in nature, and saw the great variation within species. Had Darwin used only the specimens available to him in museum collections, he likely would not have developed his theory because the collections lacked sufficient variety. After 1859, natural history collections changed as museums sought to expand the number of specimens of each species, which led to a much better understanding of biodiversity. For example, for more than 100 years after Linnaeus, the genus Pipawas thought to be distributed only in the tropical lowlands of northern South America and the island of Trinidad. However, in 1870 the first specimens of Pipawere collected in Pebas, Peru, by James Orton (1830-1877), a professor at Vassar College (Cope 1870), and Pipa pipa is now known to have existed in several localities in Amazonian Brazil and Peru. Early researchers faced a daunting task when setting out to study an organism as unusual as the Surinam toad. To determine the distribution of a species, it was necessary to write to dozens of museums around the world, asking if they had any specimens, and if so where they had been collected, and then wait for an answer by return mail. Thanks to shared electronic databases, we can now find information in just a few minutes that formerly took months to compile. A search on VertNet (vertnet.org), which lists the specimens in 380 collections worldwide, indicated that 1,198 specimens of the genus Pipa exist in collections around the world, of which 589 are Pipa pipa, the same species that Maria Sibylla Merian painted and collected in 1700. Despite the 589 specimens of Pipa pipa in museums, most of the details about the species’ reproduction were unknown until the 1960s because these toads are extremely difficult to find in the wild. Courtship and mating were eventually observed and documented in captive animals in 1960, which is a reminder that to understand nature, we need both living organisms and preserved specimens (Bartlett 1896; Rabb and Rabb 1960; Rabb and Snedigar 1960). What is the value of natural history collections? Developing natural history collections takes significant resources. A recent study at the Natural Science Research Laboratory at Texas Tech University estimated the cost of collecting mammal specimens to be US $41 for locally collected specimens, and US $74 for specimens collected internationally (Bradley et al. 2012). This is just the financial cost to collect the specimens, it does not include the cost to maintain the collection in good condition for hundreds of years. This may seem expensive, but when you consider the variety of research that is done with natural history collections, it is a bargain. Natural history specimens serve as the critical vouchers for research. The specimens are used for studies of systematics, genomics, ecology, zoonoses, and ecotoxicity. The collections are important for the identification of agricultural pests and for studying many emergent infectious diseases (including Hantavirus, West Nile, and Ebola). Preserved specimens are used in biology education, conservation, and for niche and distributional modeling. Because natural history collections are chronological records of life on Earth, they can provide evidence of anthropogenic effects on biodiversity and habitat modification, and are used to study the long-term consequences of environmental change. Using museum collections it is possible to analyze changes in species composition to evaluate the changing health of ecosystems. Museum collections are used to study biogeographic range changes (spatial and altitudinal), phenological shifts, evolutionary change (genetic and morphological), community composition, diet, and migration (Akst 2018, Bradley et al. 2014, Cook et al 2014, DiEuliis et al. 2016; Drew 2011, Gardner et al. 2014; Gropp 2018, Lister 2011, Norris 2017; Peterson 2010; Pettitt 1997, Swing et al. 2014, Twerksbury et al 2014). We now know a lot about the Surinam Toad that was a mystery to Merian, Ruysch, and Seba. We know that the family Pipidae includes 41 species, 12 of which are extinct and known only from the fossil record tracing to the Cretaceous period (Trueb and Cannatella 1986). Merian’s toad can now be fit into an established hierarchy that reflects its evolutionary history, and is used by natural history museums worldwide to catalog specimens and to order their collection storage arrays (Table 1). The Surinam toad is distributed widely in South America and Trinidad, and we know the habitats it prefers, how it breeds, how the young develop, and what it eats. Such knowledge originated from a combination of museum specimens, field and anatomical studies, behavioral observations in the wild, DNA analysis, and studies of living specimens in zoological parks and aquariums. It has taken a long time to collect the 589 specimens listed in VertNet. The oldest museum specimen was collected in 1700, the most recent in 2014, usually with just one or two added to collections each year (Table 2). This demonstrates how the information content of a single museum may not appear to be of very high value, but when it is combined with other museums, it is a very powerful resource. Natural history collections are needed now more than ever. For example, using a database of 423,000 museum specimen records going back to 1901, a research team analyzed the effects of climate change on 67 species of bumblebees, and predicted patterns that will likely determine future extirpations and extinctions (Allen 2016). Due to improvements in collection management and care, museums are now better able to take care of specimens so that they will be useful in the future. Collection management is based on the principles of preventive conservation with a focus on controlling the storage environment, especially light, temperature, and relative humidity, and the use of archival materials (Norris 2017, Simmons 2015). Natural history museums face many challenges in the future. As collections increase in number and complexity, providing proper care for specimens will depend on the development of better and more efficient ways to manage ever-larger collections, more diverse types of preparations, and the enormous quantity of information that gives them their scientific validity. However, in the United States many university natural history museums face budget reductions and are scaling back programs or are closing (Gropp 2003; Suarez and Tsutsui 2004). Budget cuts primarily result from lack of support from state sources but are exacerbated by relegating museum programs to lower priority than other types of research. Climate change poses a threat to the future of our collections as museums must find ways to care for their collections efficiently in changing climates. As Christopher Norris recently wrote, “Natural history museums face four main challenges: acquiring material, preserving that material, making it available for use, and making the case that the first three activities are worthy of support” (Norris 2017:14). Over their long history, museums around the world have evolved from places where order was sought and knowledge was created, to serve as centers of education and enlightenment and purveyors of cultural values. We can look ahead to the future when museum-based research will help us better understand and cope with the problems of climate change and threats to world biodiversity. Museum collections are time machines. The Surinam toads from Seba’s collection now float serenely in jars of alcohol, housed in a high security vault beneath the Naturhistoriska Riksmuseet in Stockholm. (Figure 6). These specimens tell the story of a brave woman who risked her life to study toads in South America, of a dedicated pharmacist who devoted his fortune to understanding biodiversity, and a stern taxonomist who wanted to know more than anyone else about the species inhabiting Earth. Our deep understanding of the Surinam toad comes from numerous strands of information woven into a tapestry of knowledge, because individuals cared enough to find, collect, prepare, and care for natural history specimens. It is a reminder that museums are the guardians of our natural and cultural heritage. Museums preserve memory. Museums tell the stories that make us human. And museums will continue to remain important as long as people remain curious about the world around them. The core of this article was presented as a contribution to the symposium, “Avances en Biodiversidad y Conservación,” marking the 100thanniversary of the Museo de Historia Natural de la Universidad Nacional Mayor de San Marcos in Lima, Peru, in February 2018. I thank Dr. Victor Pacheco and the other symposium organizers for the opportunity to participate in the centenary celebration of the museum. Thanks also to the Natukrhistoriska Riksmuseet (Stockholm) for the photograph from the Museum Adolphi Friderici specimen, and toDr. Erik Åhlander for providing access to the collection. Figure 4. The Natural History Museum, London. Figure 6. Natukrhistoriska Riksmuseet, Stockholm. Akst, J. 2018. “Flies R us.” The Scientist, 32(2):21-22. Allen, K. 2016. “What can you do with 300,000 dead bees?” Toronto Star, January 25, 2017. Ariño, A. H. 2010. “Approaches to estimating the universe of natural history collections data.” Biodiversity Informatics 7:81-92. Barreiro, Agustín J. 1992. El Museo Nacional de Ciencias Naturales (1771-1935). Theatrum Naturae Colección de Historia Natural, Doce Calles. Republication of 1944 edition, expanded to cover 1901-1935. Bartlett, A.D. 1896. “Notes on the breeding of the Surinam water-toad (Pipa Americana) in the Society’s gardens.” Proceedings of the Zoological Society of London 1896:595-597. Bergreen, L. 2011. Columbus: The Four Voyages. Viking Penguin, New York. Bradley, D., L. C. Bradley, H. J. Garner, and R. J. Baker. 2012. Cost of collecting and preparing mammal voucher specimens for natural history collections. Occasional Papers, Museum of Texas Tech University, Number 313, p. 14. Bradley, D., L. C. Bradley, H. J. Garner, and R. J. Baker. 2014. “Assessing the value of natural history collections and addressing issues regarding long-term growth and care.” BioScience 64(12):1150-1158. Cook, J. A., S. V. Edwards, E. A. Lacey, R. P. Guralnick, P. S. Soltis, D. E. Soltis, C. K. Welch, K. C. Bell, K. E. Balbreath, C. Himes, J. M. Allen, T. A. Heath, A. C. Carnaval, K. L. Cooper, M. Liu, J. Hanken, and S. Ickert-bond. 2014. “Natural history collections as emerging resources for innovative education.” BioScience 64(8):725-734. Cope, E. D. 1870. “Seventh contribution to the herpetology of tropical America.” Proceedings of the American Philosophical Society, 9:147-169, plates 9-11. Daston, L., and K. Park. 2001. Wonders and the Order of Nature, 1150-1750. Zone Books, New York. Drew, J. 2011. “The role of natural history institutions and bioinformatics in conservation biology.” Conservation Biology 25(6):1250-1252. Etheridge, K. 2010. “Maria Sibylla Merian’s frogs.” Bibliotheca Herpetologica 8(2):20-27. Findlen, P. 1989. “The museum: its classical etymology and renaissance genealogy.” Journal of the History of Collections 1(1):59-78. Gardner, J. L., T. Amano, W. J. Sutherland, L. Joseph, and A. Peters. 2014. “Are natural history collection coming to an end as time-series?” Frontiers in Ecology and the Environment 12(8):436-438. Gropp, R. E. 2003. “Are university natural science collections going extinct?” BioScience 53(6):550. Hooper-Greenhill, E. 1992. Museums and the Shaping of Knowledge. Routledge, London. Jorink, Eric. 2010. Reading the Book of Nature in the Dutch Golden Age, 1575-1715. Brill. Latham, K. and J. E. Simmons. 2014. Foundations of Museum Studies: Evolving Systems of Knowledge. Libraries Unlimited, Santa Barbara, pp. xvii, 155. Leroi, A. M. 2014. The Lagoon: How Aristotle Invented Science. Viking, New York. Lister, A. M. et al. 2011. “Natural history collections as sources of long-term datasets.” Trends in Ecology and Evolution 26(4):154. Mauriès, P. 2002. Cabinets of Curiosities. Thames and Hudson, Ltd., London. Müsch, I. 2001. “Albertus Seba’s collection of natural specimens and its pictorial inventory.” pp. 6 - 24 in Seba, Albertus. Cabinet of Natural Curiosities. The Complete Plates in Colour 1734 - 1765. Taschen, Köln. Mayr, E. 1969. Principles of Systematic Zoology. Theories of biological classification and their history. McGraw-Hill, New York. Nieto Olarte, M. 2013. Las Máquinas del Imperio y el Reino de Dios: Reflexiones sobre Ciencia, Tecnología y Religión en el Mundo Atlántico del Siglo XVI. Ediciones Uniandes, Bogotá, pp. xviii, 306. Peterson, A. T. 2010. “The critical role of permanent voucher specimens of hosts and vectors in public health and epidemiology.” Emerging Infectious Disease 16(2):341-342. Pettitt, C. W. 1997. “The cultural impact of natural science collections.” In J. R. Nudds and C. W. Pettitt (eds. ), The Value and Valuation of Natural Science Collections: Proceedings of the International Conference, Manchester, pp. 94-103. The Geological Society, London, pp. xii, 276. Rabb, G. B. and M. S. Rabb. 1960. “On the mating and egg-laying behavior of the Surinam toad, Pipa pipa.” Copeia 1960(4):271-276. Rabb, G. B. and R Snedigar. 1960. “Observations on breeding and development of the Surinam toad, Pipa pipa.” Copeia 1960(1):40-44. Reitsma, E. 2008. Maria Sibylla Merian & Daughters. Women of Art and Science. The Rembrandt House Museum/The J. Paul Getty Museum. Schmidt-Loske, K. 2010. Insects of Surinam. Reprint of 1705 edition of Maria Sybilla Merion’s. Metamorpjosis Insectorum Surinamensium. Taschen, Köln. Simmons, J. E.2015.Herpetological Collecting and Collections Management. Third edition. Society for the Study of Amphibians and Reptiles Herpetological Circular, pp. 42, 206. Simmons, J. E. 2016. Museums. A History. Rowman and Littlefield, Lanham, pp. xxi, 304. Simmons, J. E. and J. Snider. 2012.“Observation and distillation—preservation, depiction, and the perception of nature.” Bibliotheca Herpetologica 9(1-2):115-134. Suarez, A. V., and N. D. Tsutsui. 2004. “The value of museum collections for research and society.” BioScience 54(1):66-74. Swing, K., J. Denkinger, V. Carvajal L., A. Encalada, X. Silva, L. A. Coloma, J. F. Guerra, F. Campos Yánez, V. Zak, P. Riera, J. F. Rivadeneira, and H. Valdebenito. 2014. “Las colecciones científicas: percepciones y verdades sobre su valor y necesidad.” Bitácora Académica, Number 1, p. 46. Tewksbury, J. J. et al. 2014. “Natural history’s place in science and society.” BioScience 64(4):300-310. Todd, K. 2006. Chrysalis: Maria Sibylla Merian and the Secrets of Metamorphosis. Harcourt, Orlando. Trueb, L., and D. C. Cannatella. 1986. Systematics, morphology, and phylogeny of the genus Pipa (Anura: Pipidae). Herpetologica 42(4):412-449. Willmann, R. and J. Rust. 2001. “The zoology and botany in Albertus Seba’s Thesaurus,” pp. 27-39 in Seba, Albertus. Cabinet of Natural Curiosities. The Complete Plates in Colour 1734-1765. Taschen, Köln.